Note: This article is not meant to be a commentary on the merits of one candidate versus another. There is no doubt that Donald Trump will be a president unlike any that we’ve seen before. This is a thought that energizes some and frightens others. This post is designed to look at one facet of his uniqueness — his heavy use of social media. When President Barack Obama was elected, he was hailed as being the first U.S. leader to be comfortable with technology. He was young-ish (on the cusp of being a member of Generation X) and was touted as the first emailing president. He basically said we would get his Blackberry when it was pried from his cold, dead fingers, and the fact that there was a fight over his Blackberry makes us realize that in terms of technology, Obama’s first inauguration was a long, long time ago. Since the Obama administration began in January of 2009, we’ve seen the user base of Facebook grow from about 150 million to its now-astronomical 1.8 billion. And, here’s something to think about: When Barack Obama was inaugurated, the second most popular social media outlet was MySpace. Twitter was third. So, with all of this, it’s not surprising that our next president, Donald Trump, will use technology in a very different way than others who have held the office. The only thing that IS surprising is that at 70 years, he’s 15 years older than Obama, and is a month older than Obama’s predecessor, George W. Bush. Donald Trump used Twitter during the campaign and since being elected in a way that no one else has dared. He’s using it exactly as we, the general public, have used it. How many times have you seen your Facebook friends or Twitter followers post inane information about their breakfast, or political observations that end up ticking off friends and family? That’s exactly what Trump does. If someone irritates him, he tweets about it. If there’s something he wants to make public, he tweets about it. Finally, if he wants to point out that he was right about something, he tweets about it … a lot. He’s been using Twitter as his primary method of communication so much lately that he hasn’t held a press conference since July. In many ways, Trump is like your 70-year-old mother who figured out how to use Facebook. You’re happy she’s communicating, but some of it is cringe-worthy. The issue here is that while your mother may have 30 or 40 friends on Facebook, Donald Trump has 16.4 million followers on Twitter. 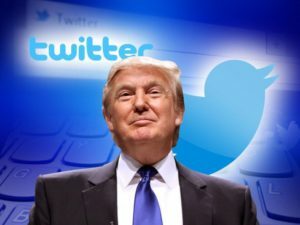 When he takes control of the POTUS Twitter feed, it will add another 12.3 million followers (although there’s likely overlap in those numbers.) For comparison, the highest circulation newspaper in the U.S. has about 2.25 million readers. When your mother posts something that’s TMI, only a few dozen people know. When Trump goes on a tirade, the whole world knows. Many will question whether Trump’s heavy use of Twitter is presidential. It’s certainly combative, and one wonders what other things he could be doing instead of tweeting at 3 a.m. But, in the end, his base responds to it, and if his only goal was to be elected, he succeeded. Since being elected earlier this month, he’s shown no sign of changing his style. And, just like we’ve had to get used to mom posting weird stuff on social media at times, we may as well get used to seeing it from our president.